As previously mentioned in the story about “A Caribbean Mystery”, the name James Bond has not been used by Ian Fleming alone. 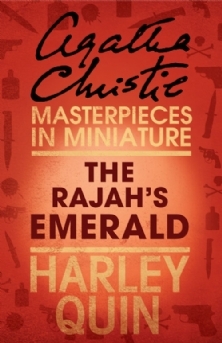 Legendary british crime writer Agatha Christie had used the name prior to Flemings 007 novels, in her short story “The Rajah‘s Emerald” which was first published in edition 420 of „Red Magazine“ July 30th, 1926 – 27 years before the first Bond novel “Casino Royale” by Ian Fleming. While Christies choice of the name James Bond remains pure coincidence, Ian Fleming “borrowed” the name for his fictional super spy from a real person – ornithologist James Bond who had penned “Birds of the West Indies”. James Bond has found himself at the fashionable resort Kimpton-on-Sea, all due to the persuasion of the young Grace who during the last few months of their courtship has become distinctly uppish. Amongst the upper echelons of society, including the Rajah of Maraputna, James feels distinctly disgruntled and out of place. Eager to both irritate and win over his sometime girlfriend, James bypasses the queue to the beach changing rooms and ducks into the private huts before impressively being the first in the sea. But, in his hurry to not be apprehended he jumps back to the huts, changes at lightning speed only to realise he is suddenly in the possession of a rather sought after object. Dabbling in a little detective work James throws himself into the breach.